In the four years since a programme called 'Mazhapolima', meaning bounty of rain, was launched in Thrissur, Kerala, the district has seen an increase in the quality and quantity of water in its wells. Most tourist brochures of ‘God’s own country’ Kerala, show off the beautiful beaches and backwaters of Kovalam and Alleppey. The state is also home to both the Northeast and Southwest monsoon receiving an average rainfall of 3000 mm annually (contrast that with around 1000 mm in neighbouring Tamilnadu or with the 300 mm in Western Rajasthan). It's hard to imagine Kerala without water; at least, the brochures lead us to believe so. But the past few summers have a different story to tell. Kerala presents its residents with a peculiar contrast – scarcity in the heart of abundance. Despite all that rain, many parts of Kerala face acute water shortage during peak summer. The culprit? Rainwater wasted as surface run-off. Due to the hilly terrain in most of the state, the water that falls on the ground, in the absence of structures to hold it back, runs off into the sea. Thus very little water penetrates into the ground. Jos Raphael, a native of Thrissur, has been working for over a decade to get the message of rainwater harvesting across to the community at large. An alumnus of the London School of Economics, his career choice puzzled many of his friends and family members in the beginning. Inspired by individuals in the field of water harvesting and management, Jos set out to bring about a change in people’s attitude as well as the summer water table. The task was by no means a simple one. He tried putting in place a ‘Rain Centre’ similar to the one in Chennai, but the cheer did not last long. After several campaigns, workshops, meetings and a couple of deadly dry spells, Jos was able to get the people who call the shots in the government to take interest in the concept of rainwater harvesting in Thrissur. 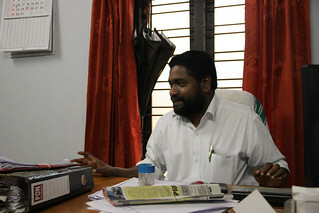 Years of intense lobbying paid off when Dr. V.K Baby took charge as the District Collector in April 2008. It was only a matter of time before like-minded individuals in the government got together and came up with an agenda to change the face or rather, the belly of the district. 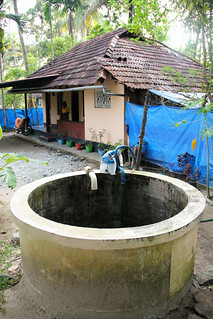 On average, around 70% of the houses in Kerala depend on dug wells for their drinking water. The proposed solution to deal with the district’s water woes was a logical extension of this – divert rainwater from roof tops to dug wells within the premises. In a state like Kerala where open wells are practically found in every house, this seemed like the most sensible and cost effective thing to do. Thus, 'Mazhapolima' meaning 'bounty of rain' was born. Thiruvilwamala Gram Panchayat was the first in the state to experiment with ‘Mazhapolima’, which was floated as a participatory effort at groundwater recharge using shallow dug wells. The presence of reddish to orange coloured water in neighboring taluks refuses to scare Baby Menothuparambil from Manalur. The dug well in her house, which she rarely used a year and a half back contained the orange liquid. What did manage to shock her was the transformation of the well water, from orange to colourless. This didn't happen by magic. It was just basic science. Shallow wells tap the water which lies in the uppermost region beneath the earth’s surface. So this layer is completely dependent on external agents such as rain for its survival. The nature of the rock underneath determines the quality of the water; if the rock beneath contains iron, then the water which moves between the soil pores also aquires the chemical. When rainwater is diverted from rooftops into dug wells, over a period of time it has a diluting effect on the water that is naturally loaded with iron. The fate of many un-used wells in Thrissur and Guruvayur districts have changed in the past couple of years while the revival prospects of several more look brighter than ever. The Gram Panchayat is the focal point of all Mazhapolima activities. The Government of Kerala had sanctioned Rs.1 crore for the programme in 2009. The state government allotted an additional 2 crores for the project in 2013. This is supplemented by the Plan Fund of some of the Panchayats. Once the funds are disbursed to the Panchayats, they are responsible for everything right from the selection of beneficiaries to the fixing of plumbing lines. On average, Rs. 4000 is allocated for each household. The beneficiary contribution is 25%, which is usually in the form of labour. The amount covers the cost of plumbing and labour for connecting the roof-top with the dug well present within the premises. Mazhapolima has managed to leverage the social capital of the region to its advantage. Community based organizations, citizen groups and NGOs shupported it, whic served as a boost for the political leadership, both at the top as well as the village level. Nearly 65 Gram Panchayats have come under the 'Mazhapolima' umbrella in the last 4 years. Plans are on to expand its reach to other districts in the state as well. 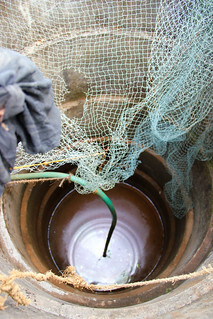 Manalur and the neighbouring Panchayats are used to seeing their public as well as household wells dry up in April and May. Many of the villages lie bordering the coast, so salt water intrusion is not uncommon. Crisply clad in a starched white shirt and dhoti, ‘comrade’ Surjith walks into the Manalur Gram Panchayat office where a sizeable crowd awaits him. One among them is keen to hear what the Panchayat President has to say about the water situation in his constituency. “You can create anything in this world, but water. Unless we connect with nature, the conflict between man and nature will go the latter’s way.” Being a paddy farmer himself, Surjith understands the importance of preserving water sources more than anyone else in the room. As a June 5th gift, a ‘Shramdhan’ was organized where volunteers from several villages got together to construct 10,000 recharge pits across the Panchayat to harvest rainwater for recharge. Two years into the programme, Surjith is a happy man. 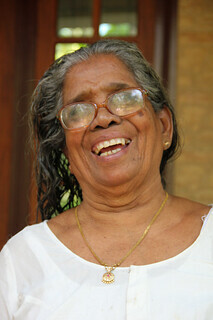 Reactions to the rainwater harvesting drive have been overwhelmingly positive. Residents of Vadanpally, very close to the sea, now get fresh drinking water from their wells; villagers at Enamavu are delighted about the dip in their detergent expenses as their hard water has slowly softened, while those at Manalur are glad that they no longer have to stare at ‘Rasna’ in their wells. It took a week for the hub bub in Elavally Panchayat to settle. Groups of students and teachers from St. Sebastian’s High School at Chittatukara armed with satchels filled with questionnaires and measuring tapes headed out to the constituent villages of the Panchayat. The region was hard pressed for water in the summer months, and the door to door campaign primararily aimed at documenting very basic data such as the number of dug wells, water level in the wells as well as the usage pattern. Headmaster C.V. Johnson recounts how out of all the schools and institutions in the Panchayat, the President and members chose his school for this project. Founded by the missionaries in 1904, the school has excelled both in academics as well as extra-curricular activities. To encourage students to be conscious of their environment, the school authorities jumped at the opportunity and made the most of it. Students were encouraged to visit houses in and around their villages and talk to them about water harvesting apart from collecting base-line data for the Gram Panchayat. The students now have a first-hand understanding of the situation in their locality and some of them still go back to check on the houses they visited almost two years back. The details of the survey were given to the Gram Panchayat who assessed the need for ‘Mazhapolima’ based both on water quality as well quantity in the villages. 450 households were identified for the programme subsidy where the plumbing connecting the roof-tops to the dug wells will be put in place. 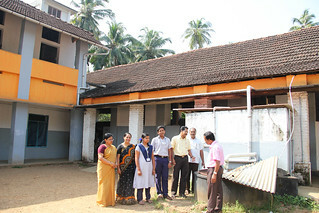 Head Master Johnson vouches for the programme’s success, atleast in his school, which no longer is dependent on external sources for drinking water. One of the driving forces behind Mazhapolima's success in Thrissur was and is the continued support of the television and print media in general, and the vernacular in particular. The aims and objectives of the programme were widely written about in and around the time it was launched. In 2004, Malayala Manorama ran the 'Pala thulli' campaign (many drops) exclusively to get the message of water conservation and management across to its wide audience. On similar lines, several Malayalam magazines and newspapers continued to feature the good, bad and ugly of the state's water scenario. Just as the demand for water is ever-increasing, so is the need for conserving it. Positive results from the ground have boosted the team's resolve to take this a step further. Plans are on to scale this up and take it to more districts in the state. Work has already begun in neighbouring Palakkad and Malappuram districts. An effort of this scale is sure to bring about a sea of change in the state's waterscape. With over 15 lakh open wells in just the state of Tamilnadu, one can hope that this movement slowly permeates outwards into the neighbouring water-starved states as well. The primary caretakers of water?